How Do You Spell Llama? 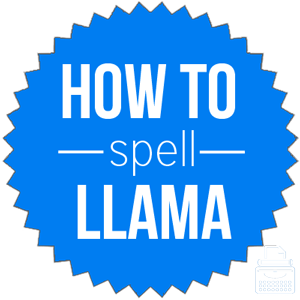 Home » Spelling Dictionary » How Do You Spell Llama? Spelling of llama: llama is spelled l-l-a-m-a. It is the only common English word that begins with a double l.
Definition of llama: A llama is a South American mammal. It has a long neck and small head and is related to the camel. It is smaller than a camel and does not have a hump. It is used, especially in the Andes, as a pack animal and a source of wool. Pronunciation of llama: Llama is pronounced la-ma. A llama is an animal native to South America. Being an animal, llama functions as a noun in the English sentence. The villagers use llamas to transport crops to the local town. Llamas are particularly useful as a source of wool. Throughout the centuries, many societies and cultures have used llama wool for cloth and clothing. This soft woolly fleece is valuable and makes llamas a sought after resource. The practice of using llama wool for clothing is so common that the word llama itself can sometimes be used to describe a piece of clothe made from the animal’s wool. There are no common phrases that use the word llama, but due to its comical appearance, it sometimes appears in English puns or jokes. For example, “no prob-llama” or “save your drama for your llama.” In some cultures, the llama is a symbol of hard work, tolerance, and resistance. Probably from the early-17th century, llama in Spanish translates as “flame.” However, it is also used in the common phrase “como te llama?” (“what is your name?”). The word’s association with the animal is thought to have originated from Quechua (modern day Peru). Llama is a noun that refers to a long-necked, wooly, domesticated pack animal found in the Andes.